parody, revisit, review or even re-photograph Ruscha’s short and influential publications. The book, entitled Various Small Books. 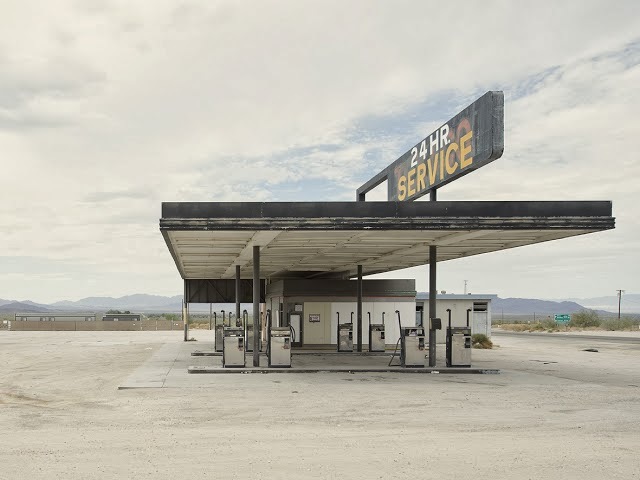 contained a good number of proposals, which proceeded to «appropriate», among others, the first of Ruscha’s books on gas stations. viewpoint, in the different photographic series produced by the author, such as for example Collecting Homes, Collecting Cars, New American Topographics and Parking Lots. by extension, pointing to a repeated and archetypal commercial and industrial infrastructure revolving around roads and the motoring culture. importance of this latter shift in the information. book Learning from Las Vegas stated that the familiar Shell and Gulf advertisements stand out like friendly beacons in a foreign land. primary effect, in the matter at hand, is to facilitate the abstraction and revelation of the shapes. defining his position and viewpoint in this work, we need to return to how he specifies the road or exact location of each gas station. of his images and which somehow determines both his status as a traveller and the current condition of the service stations themselves. stations to their demise. Furthermore, new roads and urban bypasses contributed to the endemic isolation of these infrastructures». is none other than the result of globalization, of the hegemony of the multinationals and of universal standardization. red gas pumps will now, and ultimately, be true ruins.